In late December of 1779 Christopher Billop the owner of Billop House located on Staten Island in New York accused one of his female servants of spying on him for the Colonists. The American Revolutionary war had commenced and Billop was an avid British loyalist. He very large in statue was known to be a man with a violent temper. A colonel, he led a Tory detachment during the Revolutionary War and despised any who fought against the English. When he accused this female servant of spying on him she vehemently denied his charges. This enraged Billop who then grabbed her and threw her down the stairs. She died of a broken neck and Billop was never accused or tried for her murder. Billop and this serving girl have haunted Billop House for 223 years. The ghosts of British soldiers are also seen on the property. Billop House or Bentley Manor ** is a stately stone mansion that was built in 1680 on 1,600 acres of land. The Colonel inherited this home -- his great grandfather built it. This house overlooks Staten Island Sound, specifically Raritan Bay. The mansion includes: a spacious attic, two floors each with three rooms, a large basement kitchen and a secret tunnel. This tunnel leads from the home’s root cellar to the edge of Staten Island Sound. Three years before Billop murdered his servant girl this tunnel was used for the only official peace conference between the British and Colonists during the war. In 1776 the war was not going well for the Colonists. 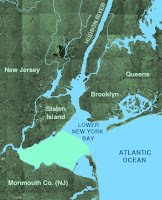 The British controlled New Your City, Staten and Long Islands. 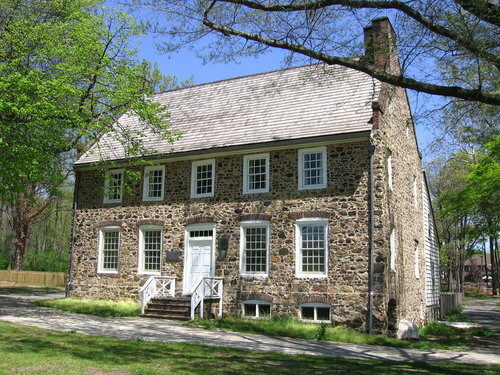 The Colonists in September were near defeat so it was arranged by Lord Richard Howe to meet with Benjamin Franklin, Edward Rutledge and John Adams at Billop House. Howe after emphasizing that the British intended to end the Revolution and crush its leaders offered to end the war if the Colonists would swear allegiance to England. Considering this tone it is not a surprise that Adams and the others refused this offer. Colonel Billop took great delight in the fact that these talks ended the first day. He felt these traitors to England would shortly be destroyed. After this Billop’s mansion was given a new nickname, “Conference House”. Billop was very happy his home now symbolized his loyalty to the British and even more important England’s power. Throughout the war Billop opened his home to British soldiers that needed to rest--his large basement kitchen was converted into a hospital. Often soldiers were smuggled into his home at night through the tunnel. Soldiers that died at the home were hastily buried around the large estate for there was no time for funerals. It is stated this is most likely the reason why the ghosts of British soldiers wearing redcoats are still seen on the property today. Billop’s vehemence toward patriots during the war made him a target. He was kidnapped and held for ransom twice. In June of 1779 a group of patriots rowed across from Perth Amboy in New Jersey. Billop was held for two months. The second time he was kidnapped was in November of the same year. Both times he was held as a P.O.W. in the Burlington County jail in New Jersey. He was chained to the floor and only fed bread and water. He was told this was retaliation for prisoners held by the British. The second time he again was held for two months and then released just after Christmas. When Billop returned home he was convinced that one of his servants had aided in these kidnappings. He had seen a servant girl place a lantern in a second floor window, which he felt must have been a signal to the men supposedly hidden at a church steeple in Perth Amboy. When next he saw this servant girl place a lantern in this window he went mad. It was mentioned after this that the poor girl was just doing one of her nightly chores. Billop had her body buried in an unmarked grave on the property. When the war ended Billop fled to New Brunswick, Canada where he lived until he died at the age of ninety in 1827. 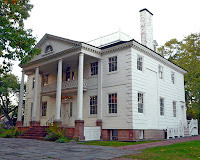 In 1783 Billop House was confiscated by the state of New York. Over the years it was used first as a multi-family home, a 19th century hotel and then a rat-poison factory. In 1929 a non-profit organization called Conference House Association prevented the house from being torn down, they have maintained it ever since. The grounds today consist of only 226 acres and the property is now called Conference Park. This association does not allow paranormal investigations. For years neighbors have reported that the home and property appear to be haunted. Reports include: soldiers wearing redcoats wandering the gardens, kitchen and the tunnel. A man has been heard singing and others have reported being tapped on the shoulder by an unseen hand. Many state that there is a residual haunting of the murder. A man is heard shouting loudly, then a woman screams as sounds of her falling are heard. This struggle is heard over and over again. The servant girl’s grave has never been found and the exact number of ghosts and their names, except Billops, has never been discovered. * Billop House is the only pre-Revolutionary manor house still surviving in New York City. It was added to the National Register of Historic Places in 1982. Abbey was first used as a priory in the 1700s for the canons of the Order of St. Augustine or as they were known the Black Canons. ,In 1440 Sir John Bryon acquired the property and turned it into a mansion. For 300 years the Byron Family lived at Newstead. According to an old superstition people become cursed and have bad luck if a religious home is then used for a personal or private reason. Several generations of the Byron Family who lived at Newstead did experience bad luck and declining fortunes. 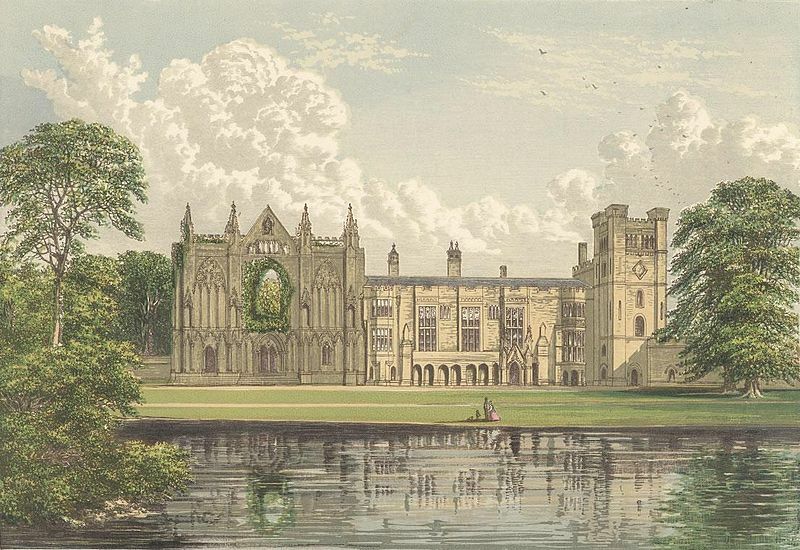 By the time the last Lord Byron, the famous Romantic poet, lived at Newstead Abbey it was in bad shape. When he inherited the estate his mother was too poor to live on the property and his father who was known as “Devil Byron” was forced to live in the mansion’s scullery--it being the only room in the home that had a roof that didn’t leak. 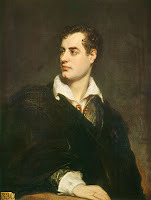 In 1818 Lord Byron sold the property to a friend, Thomas Wildman. The curse continued because the Wildman family experienced bad luck while living at Newstead. Several more families that owned the property after this were also plagued by bad luck. Beyond this curse it appears Newstead is haunted as well. One of the ghosts seen on the grounds over the years is the “White Lady”. It is stated that this lady, Sophia Hyett was a fan of Byron’s poetry and that she lived nearby the Abbey. When the Wildmans’ discovered this they gave her permission to roam their gardens whenever she liked. 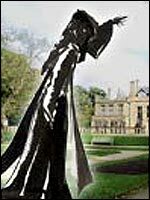 Newstead Abbey’s most talked about ghost is that of a tall dark monk called the “Goblin Friar”. This spirit is considered a harbinger. This spirit would only appear to heads of the Byron family just before something bad or unhappy happened. He appeared to Lord Byron the poet just before he married Anne Milbanke. This marriage turned out to be a disaster that lasted for only one year. Lord Byron wrote about his encounter with the Goblin Friar in a poem he wrote entitled, Don Juan. Lord Byron spotted yet another ghost in one of the Abbey’s bedchambers. He was sleeping in a room called the Rook Cell when he was startled out of a sound sleep by the sensation that something had entered the bed with him. As he sat up he spotted a featureless, dark mass that had glowing red eyes. He watched as this form rolled off his bed and disappeared as it hit the floor. Yet on another occasion he saw a mysterious white vapor rising from the floor, which vanished without a trace. Byron’s pet dog, a Newfoundland by the name of Boatswain also haunts Newstead. One of Lord Byron’s last wishes was to be buried with his beloved pet near the altar in the Abbey. Boatswain was buried there but when Byron died in 1824 his last wish was ignored because he was not buried in the Abbey. It is stated that Boatswain’s ghost is seen wandering the property because he is looking for his master. Another ghost seen at the Abbey is called the “Rose Lady”. This entity is seen in a passageway located at the bottom of the staircase. When the Rose Lady appears she is always accompanied by the scent of roses or lavender that lingers after she disappears. One notable appearance she made in more recent years was in front of a group of people touring Newstead. The staff felt she made this appearance as a form of protest. The guides had not included her story in the tour--after she appeared they started to include her. Since she has not been seen as often. The ghost of the second Lord John Byron who lived at Newstead in the mid 17th century was seen for a period of six months after his death. He died several hours after his wife died. Soon servants at the Abbey started to see him sitting in his favorite chair by the fire in the Library smoking his pipe and reading a book. This so startled his servants they refused to enter this room for years afterward. One legend connected to Newstead is about the rooks--cousins to the American crow-- that stay on the property. It is stated that these birds contain the souls of the Black Monks that once lived at the Abbey. The American author Washington Irving observed this phenomenon while staying at Newstead. He saw these rooks leaving all at once in the morning to search for food--he then saw them return in the evenings, en mass. These birds did this Monday-Saturday but he was told that on Sundays they never left Newstead’s grounds. Irving didn’t believe this until he saw it with his own eyes. The belief that these rooks are the former monks is so strong that the hunting and shooting of them is strictly prohibited. * Lord Byron was an eccentric who held contempt for most women. But women loved his poems so they overlooked this fact. It didn’t hurt that despite his clubfoot he was considered a very handsome man. During his life he was involved in several high profile love affairs. This story isn’t a typical ghost story, but it is always identified as one. 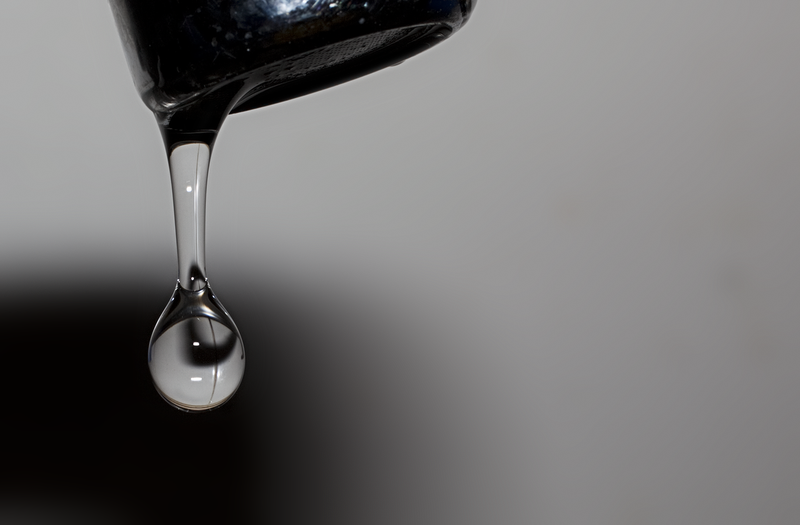 Drip, Drip, Drip is often told around a campfire or at a slumber party. I have heard and read many versions but the one I share here I consider to be one of the creepiest. Once heard, this story is not easy to forget. My best friend in middle school was a girl named Sarah. Sarah was a “latchkey kid.” She often came over to my home after school because both her parents worked into the early evening. We would do our homework together, and then my mother would inevitably invite her to dinner, but she rarely accepted this invitation stating she needed to get home to see her dog. Sarah loved Brownie her dog more than anything. The few times I had walked Sarah home I was greeted by him. He was an overgrown mutt with more joy than sense. He would jump on me and try to lick my face. One afternoon as I walked home with Sarah I asked her if she was ever afraid of being alone. She hesitated and then confided that she always checked to make sure all was well before she entered her home. Once at her house Sarah showed me how she checked. She placed her hand through the mail slot on the front door--she waited then giggled and pulled her hand back out. She turned to me holding her hand up for my inspection. She announced, “Brownie licked it so everything must be okay inside.” She pulled her key out of her pocket and unlocked the door. I followed her inside. Now in a panic, Sarah rushed out of the kitchen and headed toward the home’s bedrooms. As we drew closer to her room the drip, drip, drip sounds became louder and louder. As Sarah rushed into her room, she called out Brownies’ name, but her voice turned to a scream. On her dresser, a bowl was catching blood dripping from above. Horrified, I saw Browning hanging upside down from the ceiling. His throat had been slit. Sarah was screaming. I grabbed her and forced her from the room. Silent now, she turned pale. I pulled on her arm as I led her quickly to the kitchen back door. She seemed to come to her senses as I tried to push her out the door. It took all my strength to force her out and away from the house. Sarah sobbed quietly as she pulled away from my grip. The Alamo was built as a mission to Christianize and educate the Native Americans in the 1700s. Before the Battle of the Alamo, the ground where the Alamo Plaza is located was used as a cemetery between the years 1724-1793. It is estimated that about 1000 people were buried here during this time. In the 1830s the mission housed various revolutionaries and rebels. It was at this time that the building was turned into a fortress, high walls and numerous outbuildings were put in place. 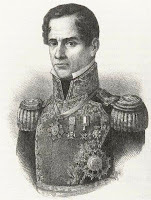 In 1836 General Santa Anna marched on San Antonio with 1,000 troops, his goal was to conquer the rebellious Texans. When he arrived on February 23, 1836, 145 Texans took refuse within the fortified grounds of the Alamo. For the next 13 days, a raging battle ensued. 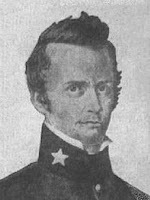 William B. Travis commanded the regular army, and Jim Bowie commanded the volunteers. They managed to increase their number to 182 men defending the Alamo. But Santa Ana’s reinforcements at the same time swelled to 4,000 men. After the battle, the bodies of the Alamo defenders were looted, dismembered, buried in mass graves, dumped in the river, or burned. All of the fallen Mexican soldiers were buried in the area. Today, construction crews and utility workers still turn up skulls and other bones when excavating the area. This long tragic history has resulted in the Alamo being the site for a large number of unsettled souls. For two centuries tales of apparitions at the old mission have been reported. 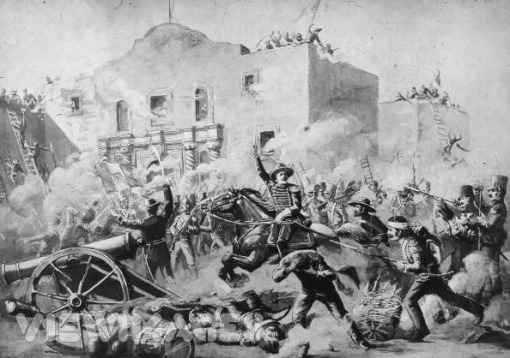 The first ghostly sighting happened only weeks after the Battle of the Alamo. When Santa Anna moved his troops to San Jacinto, near Houston today, he left 1,000 men in San Antonio to control the rebels. His plans were waylaid when Sam Houston and his Texican Freedom Fighters captured him in April of 1836. In an attempt at retaliation, he sent messengers to order the total destruction of the Alamo. When Santa Anna’s troops approached the church with torches, a legend states six spirits-- in some versions described as the “six Diablo’s” or devils-- suddenly appeared before the front doors of the mission, waving blazing sabers and yelling, “Do not touch these walls!” The Mexicans fled in fear refusing to return even when threatened by their superiors. Some say these spirits were actually monks protecting the mission. A second attempt was made to burn the Long House Barracks. However a male spirit arose from the roof, it stood above the Mexican soldiers holding two flaming balls of fire in its outstretched hands. At this sight, the soldiers fell to their knees and covered their eyes. Again they refused to return. 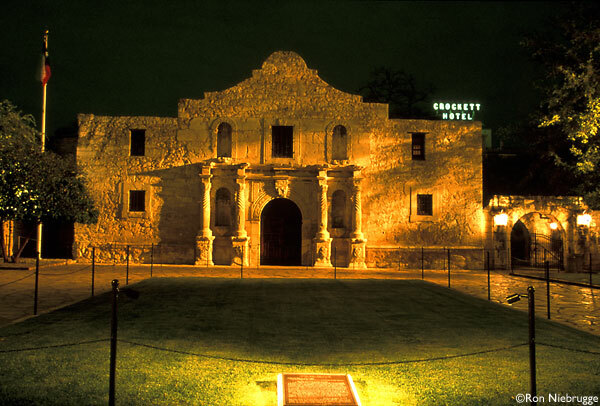 For the next ten years, the Alamo lay in ruins. In 1846 with Texas’ annexation into the United States, the U.S. Army began to occupy the complex; they repaired the old church and the barracks. By the late 19th century, the City of San Antonio turned the old mission into police headquarters and the barracks into a jail. More tales of ghostly happenings at the Alamo were told. It became common knowledge the area was haunted. Between 1894-1897 the prisoners started to complain about seeing ghostly sentries that paced along the roof of the police station, shadows were seen, and moaning sounds were heard by the staff and prisoners. Several local newspaper articles were written about this. The guards and watchmen started to refuse to patrol the building after sunset. This caused such an uproar that the prisoners were moved to another location. Today, apparitions appear to staff and tourists at the Alamo. In fact, there are so many reported sightings just a few will be shared here. Several Federal Marshals have quit their jobs after encountering wandering entities on the portion of the lawn that covers the old cemetery. In the gardens of the mission a spirit cowboy, wearing a black duster and hat, appears dripping wet as if he has ridden through a thunderstorm. Some historians feel this spirit may be one of the 22 dispatch riders that William Travis sent seeking assistance. One spirit spotted often is a little blonde haired boy who is seen today in the left upstairs window that houses the Alamo’s gift shop. Witnesses state he has a “lonely or forlorn expression.” Some believe this boy returns every February to search for his father who died in the battle. Another spirit is of a woman who has been seen near the water well on one side of the church. She appears at night and manifests as a misty torso. Many workers will not enter the basement area of the mission because there is a spirit of an Indian who creeps up behind people. As they turn to see who it is, they see him disappear or walk through a solid wall. Park Rangers, have reported seeing Davy Crockett wearing his coonskin cap and buckskin clothing. His transparent figure is spotted standing guard at various locations holding his flintlock rife. Many visitors, while on a tour of the grounds have reported seeing two young boys, aged 10 and 12 that appear suddenly. These boys then tag along with the group until it reaches the sacristy room in the Alamo Church where they mysteriously disappear. It is speculated that the boys were the sons of an Alamo Artilleryman, Anthony Wolfe. 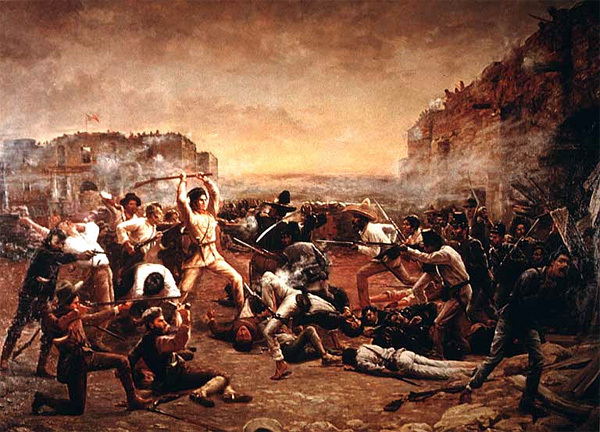 They were mistaken for fighters and killed during the final assault when they were spotted hiding in the Alamo church. Even the spirit of John Wayne has been spotted. People say he was so obsessed about doing research about the battle while he made his movie about the Alamo that he now returns to talk to the real participants who died. * At least 14 people survived the siege, almost all women and children. One African-American man survived who had fought alongside the defenders--his life was spared when Santa Anna’s soldiers mistakenly felt he was a slave and didn’t fight. 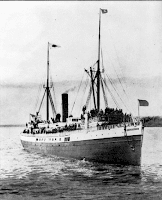 The S.S. Valencia was a small passenger steamer. With 94 passengers and a 60-member crew, it was on a return voyage from San Francisco, it was headed for Seattle via Victoria, British Columba. With high winds and strong currents, it missed the entrance to the Strait of Juan de Fuca. This set off a series of tragic events. 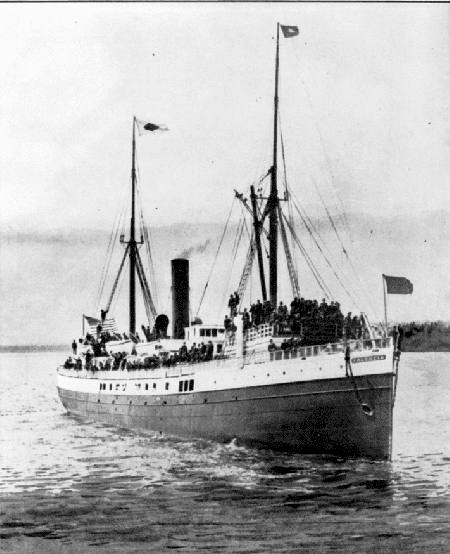 Minutes before midnight on January 20, 1906, Valencia struck a submerged reef off Vancouver Island in Pachena Bay. The ship then became wedged between rocks--this plus high seas prevented rescue boats from drawing near the ship. These rescuers watched helplessly as the powerful waves tore Valencia apart. They also watched as countless people were swept into the sea and drowned. Some passengers and crew managed to climb high into the ship’s rigging --some hung on for two days before the sea claimed them as well. In the end, the ship SS City of Topeka picked up only 37 people of the 157 people that had boarded Valencia. 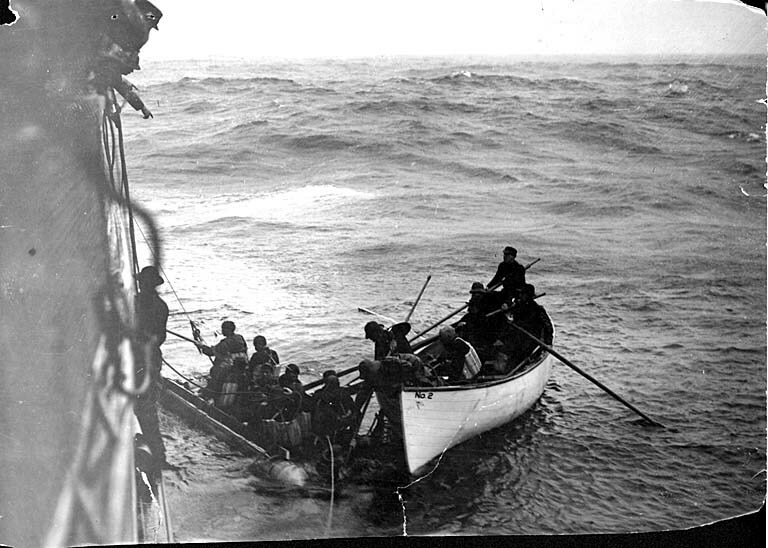 Over 100 people were drowned--including all the women and children. Almost immediately Valencia became a phantom ship. As the City of Topeka headed toward Seattle, they met an outward-bound ship. They slowed to tell this ship the sad news of the wreck. Black smoke from the Topeka’s stacks settled over the water in a dense cloud. As this cloud broke up the people on the Topeka were horrified to see a familiar shape of a steamship--it was Valencia. Ever since the wreck, seamen sailing past the west coast of Vancouver Island where Valencia broke apart have reported seeing the form of a ghost ship. They describe seeing waves wash over the floundering ship with human forms clinging desperately to its rigging. Indians that have explored the caves in Pachena Bay report that they found a lifeboat with eight skeletons in it in a large cave. It remains a mystery how this boat got in the cave for a considerable boulder blocks its entrance. This and the fact that there are dangerous waters at the cave’s entrance have prevented the removal of this boat. One legend states fishermen in the area for years have reported seeing lifeboats moving across the water manned by skeletons. 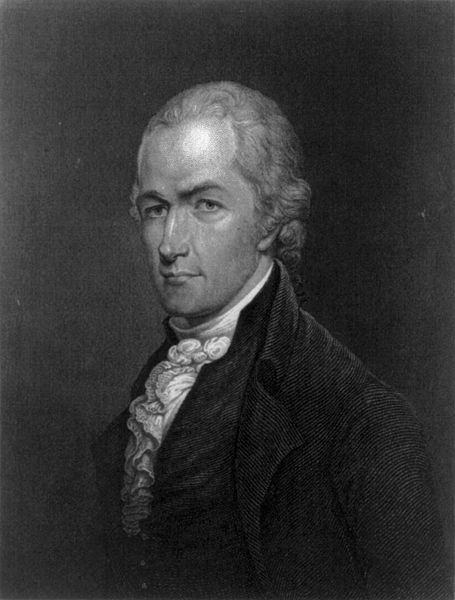 By the time Aaron Burr and Alexander Hamilton met to duel the two men had been political and personal enemies for over a decade. This fight ended Burr’s political career. After the duel, Burr became very bitter. It is for this reason that many state his ghost still haunts the New York area. Alexander Hamilton was a Federalist and Aaron Burr was a Republican. These two men first clashed in 1791 when Burr was elected to the U.S. Senate. His opponent was Hamilton’s powerful father-in-law Philip Schuyler. Then in 1800, Hamilton wrote a highly critical piece about President John Adams. This piece was meant for private eyes only but Burr published it. This caused great embarrassment for Hamilton and caused a rift in the Federalist Party. When Burr and Thomas Jefferson tied in balloting for the presidency Hamilton lobbied Congress aggressively to vote for Jefferson. His campaign had little effect but Jefferson did emerge the winner. 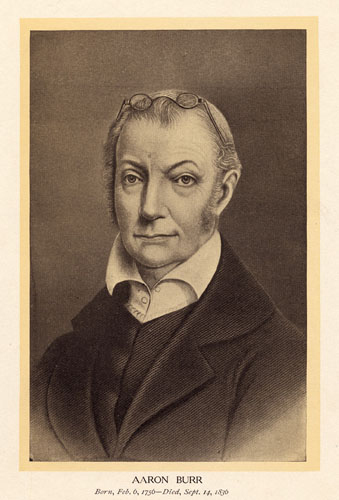 Burr then became the third vice-president. By 1804 the feud between these two became violent. When it became clear that President Jefferson was going to drop Burr from the ticket for his second term in 1804, Burr decided to run for governor of New York. Burr turned his back on the Republican Party and ran as an Independent instead. Hamilton waged a campaign to try and convince New York’s Federalists not to support Burr’s bid. But again his campaign failed. Burr’s bid for governor failed as well. Burr in April sent a request to Hamilton asking him if he had actually said this. In a round of heated letters, Hamilton neither denied nor admitted to this statement. 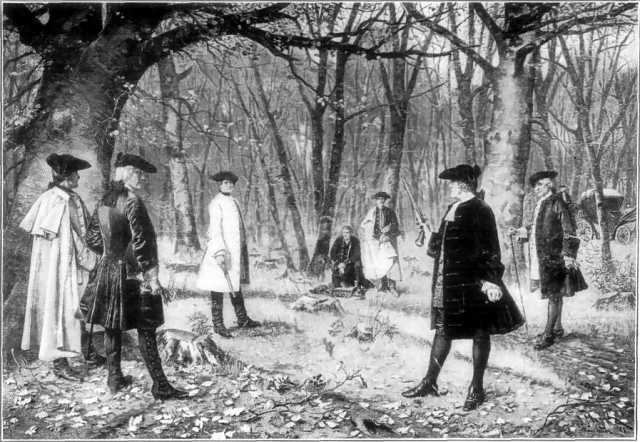 Since Burr did not get the apology that he was seeking he challenged Hamilton to a duel. Hamilton had no choice but to accept in order to save face. Duels by this time had been outlawed by the states of New York and New Jersey but Burr for some reason felt his challenge would revive his waning political career. The two men faced each other on the morning of July 11th outside Weehawken, New Jersey. Each man fired a shot-- Hamilton hit the ground mortally wounded--he died the next day. Burr walked away unscathed at least this is what he thought initially. He was charged with murder, he then fled to visit his daughter in South Carolina. * Later he returned to Washington to complete his term as vice-president. The charges against him were eventually dropped but he never again held elective office. In 1807 he was charged with treason, he had attempted to colonize the Southwest but he was acquitted. Not surprising, Burr is considered one of Americas most controversial Founding Fathers. Burr’s ghost is seen in several locations. The Morris-Jumel mansion located in northern Manhattan is one of these places. In 1833, at the age of 77, Burr married one of America’s wealthiest widows, Eliza Jumel. But it wasn’t long before Eliza realized that her new husband’s land speculation deals were draining her fortune. Another area that Burr’s ghost is seen is in New York City’s West Village. Several witnesses have stated that they have seen him wandering through the streets in the Village. One restaurant, located on Barrow Street called One If By Land, Two If By Sea has laid claim to his ghost. 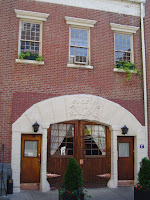 Many accounts state this restaurant is located in what was once Burr’s Carriage House. Actually, this Carriage House wasn’t built until after Burr sold the property. Employees over the years have encountered Burr’s ghost in the basement of this structure. It is said he likes to trip people as they walk down the stairs. Several workers have quit after this happened to them. 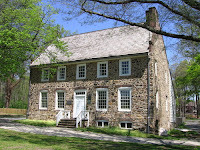 After the duel, Burr first fled to New Hope, Pennsylvania. It was here he found a safe haven in a private residence. Today this house is known as the Aaron Burr House. Burr’s ghost has been seen in this home, now a Bed and Breakfast, over the years. * I wrote another post about the ghost of Aaron Burr’s daughter Theodosia Burr Alston here. ** The Morris-Jumel house has a very interesting history. It is stated that Eliza killed her first husband for his money--her ghost also haunts this mansion. Her story is told here. A good collection of ghost folktales from Norway were first written down over 200 years ago. Several of these originated after the Black Plague had devastated the country. This disease hit Norway harder than the rest of Europe. 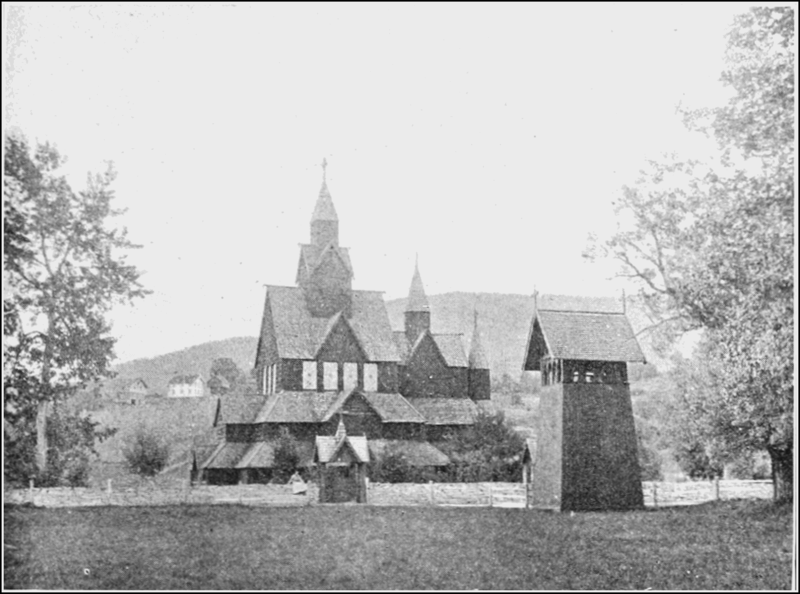 The result was many of the tales that came out of this period of Norway's history were still being told in the 1800s. The following tale, The Midnight Mass of the Dead * is one of these stories. It was late one Christmas Eve as Adelina sat by her fire; she hoped the firelight would help keep her awake. She wanted to attend the Midnight Mass. But the fire’s warmth had the opposite effect--it lulled her to sleep. She did not wake until she heard the village’s church bells ringing for the start of Mass. In a panic she ran out of house and down the snow-laden hill. She arrived at the church just as the Mass started. She took a seat and focused upon the priest who stood on the altar. She had trouble concentrating as a feeling that something was amiss overtook her. With every breath she exhaled the church seemed to become colder and colder. She noticed that the other parishioners that sat near her seemed pale and motionless. She wondered at the quiet joyless responses they gave the priest. At Christmas normally people were happy. Halfway through the Mass a feeling of horror clouded her thoughts as she realized what was wrong. Everyone that she had recognized in the various pews were villagers who had died. Now she sat frozen afraid to move looking neither left or right. She felt several sets of eyes glaring at her as many of the dead around her started to grumble under their breath. Shortly before the priest gave his last blessing a neighbor she recognized approached her. This lady had died a few weeks before. Coming to her senses she fled the church and ran up the hill quickly as ghostly footfalls seemed to pursue her. She had no trouble staying awake till sunrise. The next day as she entered the village church only the living were inside and she was able to stay until the Mass ended.